Radical innovation is coming to real estate: Will you survive it? Webster’s Dictionary defines innovation as “the act of introducing something new.” That’s weak. Someone could introduce a new shape of marshmallow into the market, but it creates little change. So let’s redefine the word. There are two levels of innovation, the first being “incremental innovation — new, but not lethal.” When a marketplace sees incremental innovation introduced, there may be a little shuffling about of the main characters. Somebody might get scratched; there could be a little bleeding and a twinge of fear, but everybody lives and nothing cataclysmic occurs. A radical innovation happens when a dominant player is uprooted by the radical innovator, and then a number of imitators quickly follow. Think about Apple uprooting BlackBerry and all the smartphones rapidly appearing. Think of Starbucks appearing and of all the new imitator boutique coffee shops cropping up while donut shops closed their doors. Think of IBM and Wang mainframes disappearing while millions of desktop computers proliferated. Something radical hit the market; the old guard was destroyed, and a multitude of imitators filled the void. Let’s call this the “innovation bomb” effect, when the powers that be leave a prize market unprotected (due to a lack of internal radical innovation), then someone with a new perspective flies overhead and drops this innovation bomb. Boom! The old guard almost never sees destruction coming because they are in defensive mode — trying to keep everything exactly the same without looking up or ahead. I stumbled across an ancient video where Steve Jobs is apparently fairly new to coming back to Apple and is introducing his “crazy ones” campaign. Take a couple of minutes and watch it. Apple is known for innovation in both technology and advertising, and we’ve seen a lot of this in Apple’s line of work: iPods killed the Sony Walkman, iPhones killed BlackBerry, and iPads are killing desktops and laptops — at least for a particular market segment. So when was the last time you saw something truly radically innovative in real estate? If you are not perpetually innovating and bringing new products to market in the technology business, then you are out of business — even if you founded a segment of the industry and dominated it at one time (BlackBerry). And please remember that real estate has become a tech-based industry. Once an innovation has killed you, you stay dead. There are few resurrections once an innovation bomb has taken you out. BlackBerry literally had the whole presmartphone market in its hands. Then, one day, BlackBerry was dead thanks to Apple and others who very quickly jumped in. There was a market leader; there was a radical innovation; there was a corpse; there were many imitators. Sometimes the radical innovator even has to sacrifice a little piece of its pie. What did Apple have to do before it could dominate the wireless world? Apple had to realize that its prize possessions, desktop computers, would be sacrificed. Did the company want to kill desktop computers? No, but Apple knew that the market would want the new methods. 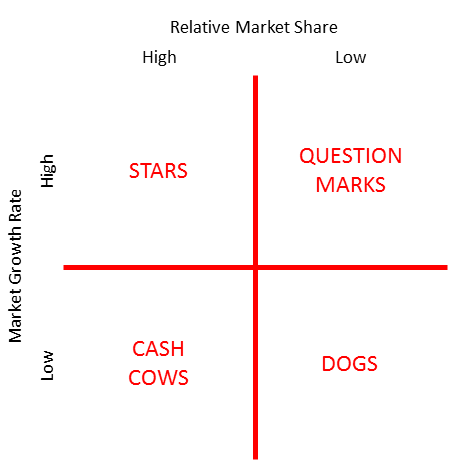 The Boston Consulting Group Growth Share Matrix is pretty old stuff, but it’s easy to understand and relevant. Apple had to decide where the market was, where it was heading, and then take a chance on radical innovation. The vertical axis is the market growth rate for either an existing product or a market segment you’re considering. The horizontal axis is your current share of that market (it could be high, or it might even be zero). Perhaps Apple management saw desktop computers as high market share, but they perceived the growth rate as slow. Thus, they took a “cash cow” position with desktop units — crank them out as long as you can, get the money to fund your innovations, but don’t heavily reinvest in this product line or market segment. Apple invested the money it made from desktop units into “question marks” — items that had a low market share at the time but a high potential growth rate. Like smartphones and tablet computers. Your goal is to keep moving “question marks” into “star” status. And you have to decide what you’re going to do before the market or your competitors do. That takes brains and guts. Looking at a simple model makes it appear easy. It is not. You are risking going out of business if you guess wrong. On the other hand, you are risking going out business if you don’t take a guess and make a radical move. Someone else will, and you’ll be BlackBerry. When was the last time you saw someone in the real estate industry walk away — sacrifice a valued core product to give the market what it’s craving? I don’t think it has ever happened in real estate, but it is going to; it has to. We have NAR, the 900 or so MLS companies, major franchises, lenders and title companies — those are the major players. Has anything innovative come along to change the market, leave a corpse and create imitators? Nothing. Any changes made so far have been incremental innovations. Zillow didn’t fully leverage its newfound power to make any radical change in the industry. It could have taken that final radical step of becoming the new universal MLS, but there was too much profit to be made from an incremental change. I am not saying that what Zillow did was good or bad. I am saying that radical innovation in the marketplace is going to leave some larger marks and more prominent casualties. The old guard often does not want change, so the major real estate players had better be keeping an eye on the sky for somebody else’s innovation bomb. After all, there’s hardly an industry in existence that has not been hit by an innovation bomb. It’s real estate’s turn. Are you looking up to see who will drop the bomb on you, or are you sprinting ahead to make the radical change yourself? Demon of Marketing On Innovation on Vimeo. The Demon of Marketing provides painfully honest strategic planning for the real estate industry.